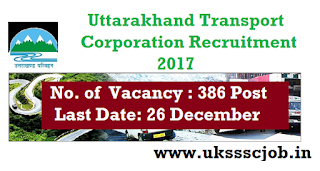 UTC Uttarakhand Transport Corporation has announced the vacancy of Driver post. candidate who is intersted can apply for the post . Read the notification carefully . 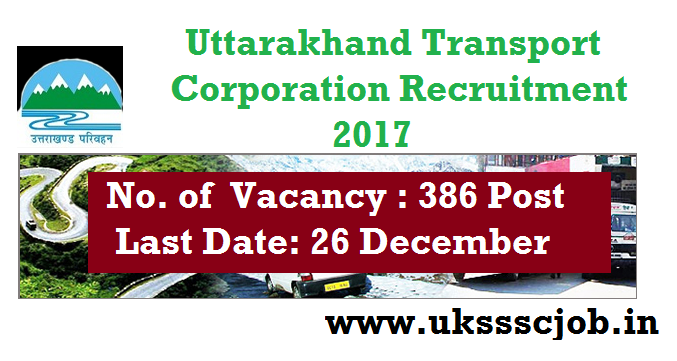 UTC(Uttarakhand Transport Corporation) Uttarakhand Invite a application for a Driver & Other Post. No. of Vacancy : 386 Post. Driver (Dehradun) : 161 Post. Driver (Nainital) : 129 Post. Driver (Tanakpur) : 96 Post. Deputy Director : Rs.15600-39100/- GP.Rs.6600. Assistant Director (Monitoring) : Rs.15600-39100/- GP.Rs.5400. Assistant Director (Social Development) : Rs.15600-39100/- GP.Rs.5400. Eligibility : Candidate have passed 10th/12th/ Diploma and equivalent examination from a recognized university. Age Limit : As on 01-07-2016 Candidate age should be 42 years..
How to Apply : Interested Candidates may Apply through download the application Form from Website Link And Send the Office Address.